A golden-collared manakin in a rainforest near Gamboa, a town along the Panama Canal. A small male bird called a golden-collared manakin performs a difficult, elaborate, physically demanding courtship dance. 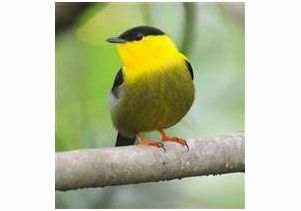 In new research, life scientists report that female golden-collared manakins select mates based on subtle differences in motor performance during these dances. 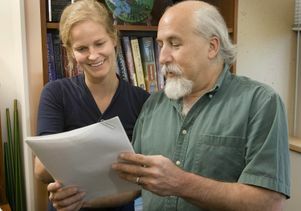 “Julia’s data show that the females select the males that completed elements of the courtship dance in 50 milliseconds over the males that took 80 milliseconds,” Schlinger said. The findings will be published in the print edition of Proceedings of the Royal Society B, a leading British journal for biological sciences research, and are currently available in the journal’s advance online edition. The courtship dance reveals the male’s neuromuscular capability, Schlinger said. Using miniature telemetry devices, Barske measured the birds’ heart rates and found that while the heart rate is normally 600 beats per minute or lower, during the courtship display it can go as high as 1,300 beats per minute. “This heart rate is extremely high; in the avian world, only hummingbirds have heart rates of 1,300 beats per minute,” Barske said. Golden-collared manakins (Manacus vitellinus) live in Panama, Colombia and Costa Rica. For the research, Barske spent three months in a rainforest near Gamboa, a town along the Panama Canal, not far from Panama City. 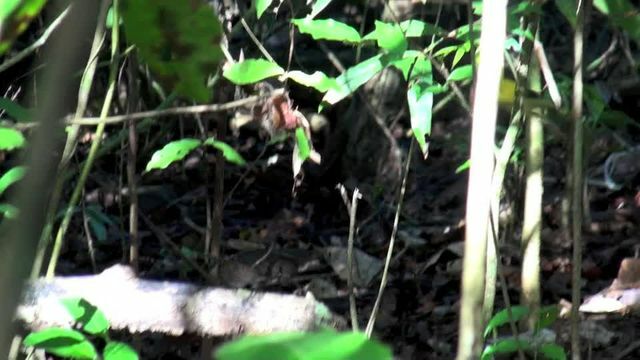 She observed the birds for several hours daily, filmed 18 male birds with high-speed video and ultra–high-speed cameras that produced 125 images per second, and recorded their courtship success. Barske can tell the birds apart from their leg rings and the location of their display arenas. Golden-collared manakins live up to 14 years in the wild. During the courtship dance, several males gather together in a small area, and each jumps from small tree to small tree while making a fast, powerful, loud snapping sound with his wings. He also does this wing-snap while perched. When the male lands on a perch, he rapidly turns to expose his feathers to the female. 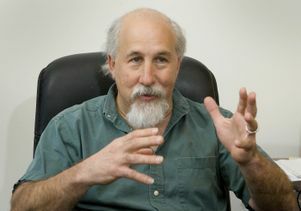 It is “intense, physically elaborate, complex, accurate, fast behavior,” Schlinger said. The male performs these feats "not necessarily because he wants to, but because that's what the female rewards," Schlinger said. "If the female rewards a slightly faster behavior, then the males will get faster. We propose that elaborate, acrobatic courtship dances evolve because they reflect the motor skills and cardiovascular function of males." During the six-month breeding season, a female will observe a group of four to six males — “the patch of forest erupts in sound,” Schlinger said — and choose one to mate with. The male offers no help in raising the offspring. Co-authors of the study are Leonida Fusani, a faculty member in the department of biology and evolution at Italy’s University of Ferrara and a former postdoctoral scholar under Schlinger, and Martin Wikelski, a director of Germany’s Max Planck Institute for Ornithology and a faculty member at Germany’s Konstanz University. 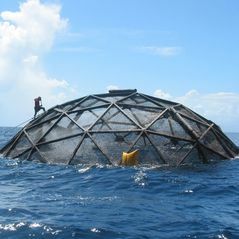 The research was funded by the National Science Foundation, as well as by the National Geographic Society. In earlier research, Fusani conducted high-speed filming of male golden-collared manakins and performed a computer analysis that showed that each male has a unique dance, somewhat similar to how each gymnast performs differently from the others. 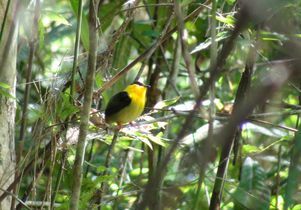 Schlinger has studied golden-collared manakins for 16 years because he "was so impressed with their fantastic behavior. 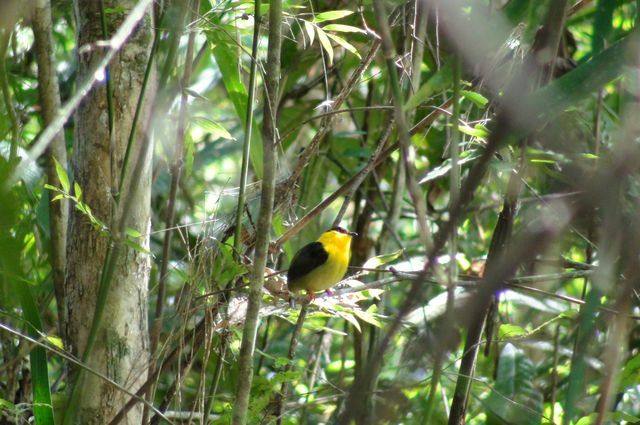 Female golden-collared manakins have a larger visual processing area in the brain than males, Schlinger’s previous research has shown, suggesting that females have a fast visual processing speed that enables them to detect slight differences in the male’s courtship dance.